Have you ever thought about raising a few chickens in your backyard? 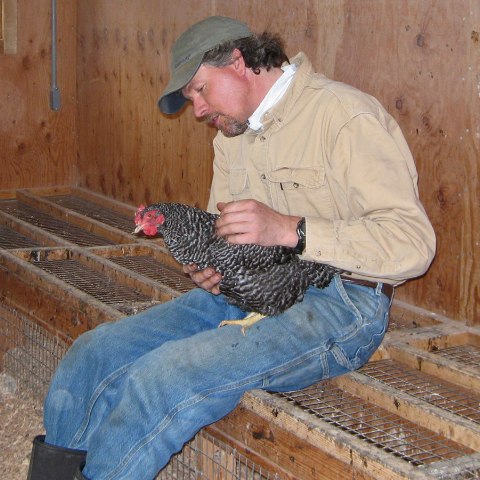 Talking with Todd Goldsmith and Diane Dear of T&D Farms, who have eighty-eight Barred Rock laying hens, I learned that raising chickens is one part worry, one part daily chores, and one part entertainment. You also need time for daily chores. “It takes the two of us about three hours a day total to take care of them.” Todd said. Gesturing toward the two flocks, Diane explained that twice a day each flock gets scratch, organic grain, fresh greens and water. They also get clean bedding every day. And then there’s egg collection. Chickens lay all day. Shaking his head amazement, Todd said that the younger flock lays sixteen eggs between 12:00 and 1:00 every day. Todd or Diane check for eggs every hour or so during the day, collecting about 70 eggs a day. “Our initial thing was to be able to feed neighbors and friends and that’s part of it and it’s been great,” Diane said. T&D Farms 30-member egg CSA is currently fully subscribed. “And,” Diane added, “they’re part of a cycle. It’s really nice to have the animals to eat the excess vegetables—they have their favorites, like pumpkin—” from their 2-acre organic produce garden. In return, the chickens produce compost for the garden. “They love greens,” she said. “Watch!” Tossing out handfuls of chopped chard, kale, radicchio, over wintered leeks, she called, “Girls, look what I got,” and the black and white birds clustered around her, clucking and grabbing for the tasty bits of salad. For Todd and Diane, it’s clear that the entertainment outweighs the worry and the chores of raising chickens. It might for you, too. And you also get eggs!